A Message for Scientists (and Everyone) on Earth Day: "Narrative is Leadership"
This Earth Day scientists will receive attention like never before (and they deserve it), but if they’re smart they’ll turn to great leaders like Abraham Lincoln and Martin Luther King, Jr. as models for how to engage the public. Both of them had what scientists tend to lack — narrative intuition. In one major Washington DC Earth Day event, the Earth Optimism Summit (where I’ll be speaking) scientists will be the main attraction. Across town at the March for Science, scientists will literally be on parade. It will be a big day, but if they want to make an impact they will need to “deliver a message.” To do that they need to understand the power of narrative which underpins messaging. Let me show you how narrative works using two of the greatest speeches in American history. I’ll analyze them with the ABT narrative template I developed and presented in my 2015 book Houston, We Have A Narrative. It’s the centerpiece of my Story Circles Narrative Training program I now run with a range of government agencies (including National Park Service, NASA, USDA, USFWS and USGS) and corporations. You won’t find it in any humanities textbooks. The closest thing is my friend Jerry Graff’s million-selling handbook for argumentation, They Say, I Say. 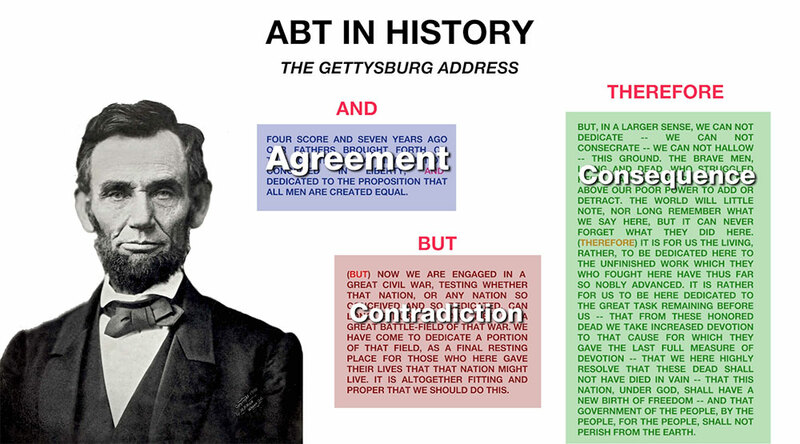 The ABT gives you a narrative statement that is both concise and compelling — not boring or confusing. If you look at the Gettysburg Address, famous for its brevity, you see it’s a perfect ABT of three paragraphs. THE GETTYSBURG ADDRESS. It’s only three paragraphs with perfect ABT structure. For Martin Luther King, Jr’s “I Have A Dream” speech his first paragraph is ABT, plain and simple. He even has the words “but” and “so” (which is the more common word of consequence than “therefore”). 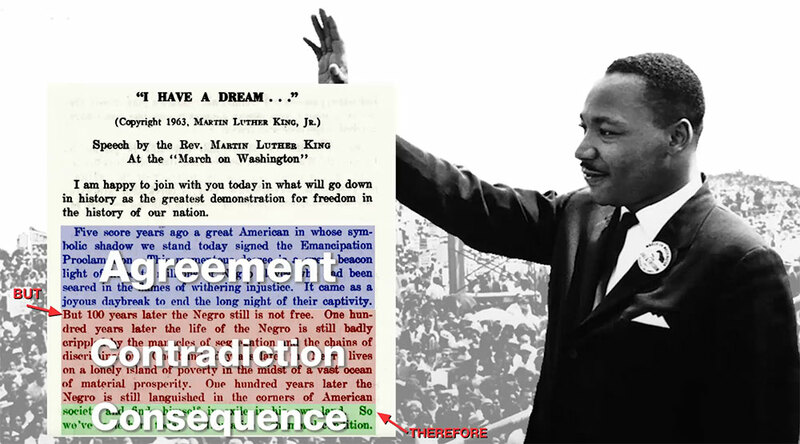 MARTIN LUTHER KING, JR’S “I HAVE A DREAM” SPEECH. The opening paragraph is an ABT. On April 22 large numbers of scientists will walk the streets of Washington DC and demand … what? What will they demand? What is their message? What is their motto? What is their slogan? What is their slugline (the short statement of their demands)? Let’s have a look at their website. In their banner is the title of the event, “The March for Science,” but nothing more. The fact is the march was announced over two months ago, but still there doesn’t seem to be a simple message. This is a problem, because when you fail to speak up for yourself simply and loudly, others will speak for you. This is exactly what has happened for the Science March. On January 31 a scientist from South Carolina wrote an editorial in the New York Times titled, “A Scientists March on Washington is a Bad Idea.” This was followed by Vox calling the idea “awkward,” BuzzFeed saying scientists were “arguing” over it, and Science Magazine offering unsolicited advice. For all of these media pronouncements there has been no clear idea of what the scientists want (i.e. the message — and maybe all they really want is to be respected, in which case they might draw their message from the motto of the nation’s largest science organization, American Association for the Advancement of Science, which is “Serving society”). Looking at the four paragraphs of text on the March for Science website you see very little narrative structure. Instead of starting with words of agreement (such as “We all know science is a cornerstone of our society”) it begins with consequence (scientists are marching). Which means from the outset they are narratively confused. It’s great that scientists are massing for the big events, but it would be even better if they could agree on what it is they want. They (and actually everyone) would do well this Earth Day to study the narrative structure of those who understand it’s power, past and present. This includes Abraham Lincoln, Martin Luther King, Jr., and yes, as I regretfully pointed out in a podcast the morning after the election, our new President. Sorry about that, but it’s still a fact that narrative is essential to lead. People don’t follow voices that are boring or confusing. It’s a principle of society that reaches back thousands of years. Scientists can’t afford to neglect it. Randy Olson earned his Ph.D. at Harvard University and became a professor of marine biology before moving to Hollywood for his second career as a filmmaker. He is the author of Don't be Such a Scientist.